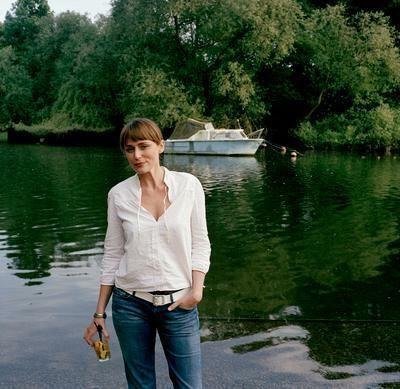 Keeley Hawes Blog: Keeley on "A Murder is Announced"
Keeley on her role (Philippa Haymes) is Marple: A Murder is Announced (2005). From the press kit. A war widower with a young child, Philippa is a little misunderstood... She's actually very, very sweet and she just wants to be liked. She has come to the village to find a better way of life for her and her son. She works as a gardener and beekeeper. She lives at Little Paddocks along with all the other misfits and seems rather settled with her lot. None of them know much about one another, but somehow they all muddle along together. I understand these situations were quite usual during that period, and it certainly adds to the range of characters under one roof. Letitia seems to really like Philippa -- perhaps it's her widowed status that gives her a tragic element, but Philippa's main concern is the welfare of her young son. As far as the beekeeping is concerned I had a 'stand-in' for most scenes. I think I got off very easily -- tending the borders was about as much as I had to do. And I'm not that green-fingered really!